As the HVAC guy repaired my A/C system last week (the air conditioning unit decided to quit working when it was 99 degrees Fahrenheit outdoors), he asked one of the questions I frequently get: How I manage to write as many books as I do!? This year I have two books releasing in November (A LIFE IN THE SHADOW OF THE CROWN and 'TIS THE SEASON FOR CHRISTMAS COOKIES), and I’m on track to have another historical fiction piece release next year as well. If all I needed to do was write the first draft and send it off, three books would be a fairly easy task. But we all know that an author has more responsibilities than just writing the initial draft. First, there's the research. Can't write historical fiction or anything else for that matter without thoroughly researching the subject matter. Then, I generally do at least six sets of edits per book, plus incorporating my editor's finds and suggestions, and a final read-through to catch any overlooked typos and mistakes. With three books published within a little more than a year, that means a total of twenty-four rounds of editing. In addition to the research, writing, and editing, there’s, of course, marketing said books. Because no matter if you're self-published or going the traditional publishing route, we all have to do our share of marketing our writings. And let's not forget the countless other tasks that writers must attend to on a daily basis: social media, communications with readers and industry professionals, writing blog posts and magazine articles, etc. Not to mention other projects, perhaps a daytime job, and just life in general. I can be extremely self-disciplined when I put my mind to it. No matter if the world around me is coming to an end or not, I make myself write every day, whether I'm healthy or feeling a bit under the weather. Well-rested or exhausted, joyful or depressed, it doesn't matter. When it comes to writing that first draft, I will write without fail. I've also become quite adept at ignoring the internet. It does take some self-discipline not to respond to social media messages or emails the instant they are received. I’ve learned long ago that those messages and emails will still be there when I’m done with my writing for the day. Writing has to be my priority because it’s my stories that my readers are interested in, not social media posts about cute kittens or puppies - no matter how much I love puppies and kittens! For most of my writing, I determine how much time I have available based on deadlines, even self-imposed ones. If I have projects that require editing, need a book cover, or require some visual aids to be added, while I’m in the middle of writing a book, I will work on those things after I have reached my daily word count goals. When I sit down to write, I like to begin my writing process by reading the last couple of pages that from the day before. I might edit a bit if I happen to find a glaring error but the primary goal is to simply get my mind on the story flow. Once I've immersed myself in my story, I like to set interim deadlines for what I like to call intense writing sessions. I just write myself a note with today's word count goal and attach a time deadline to it. Once I've reached said deadline, I establish a new one. I find that these writing sessions help me ignore my inner editor and just focus on writing. Some days I'm better at it than on others, but overall I like to think that such writing sessions force me to focus on my stories rather than get side-tracked by minutia that often just slows me down. 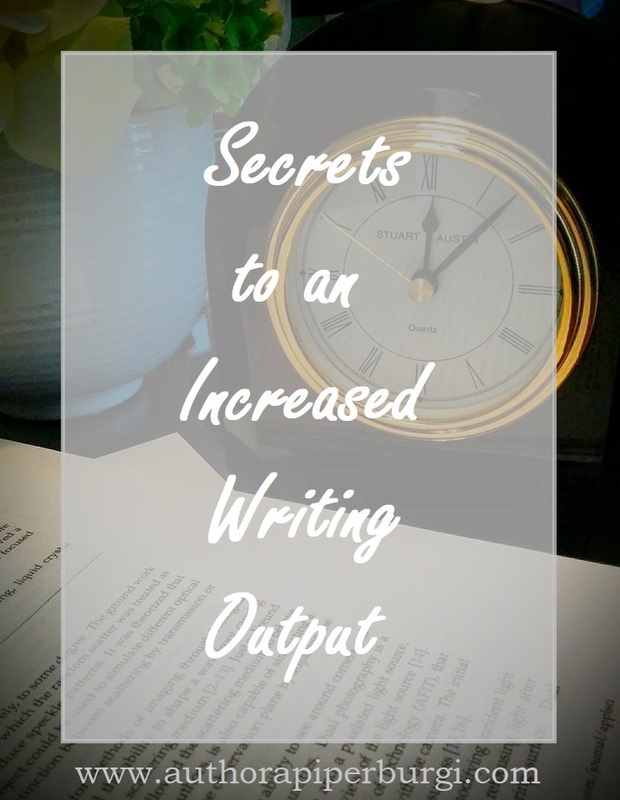 So, how do you maintain a steady writing output? What helps you to keep on writing? I would love to hear what works for you!